Students love to use "big" words and a strong vocabulary is essential to academic and career success. Here are some fun ways to use Wixie to explicitly teach vocabulary and engage students in the process of making sense of new words and remembering their meaning. Wixie’s Activities library includes many templates for explicitly teaching vocabulary. When you log in to your teacher account click the Activities tab and search “vocabulary” or browse the Vocabulary folder in the Language Arts section of the Wixie Curriculum Library. Once you have selected the activity that meets your curriculum goals, you can assign the activity to your students. For example, you might assign a Frayer model template to help students think about new words in a range of ways. Wixie makes it easy to add both text and imagery to support their thinking in each of the categories on this organizer designed by Dorothy Frayer and colleagues at the University of Wisconsin. The Wanter poster templates are another creative way to get students thinking about words in different ways. 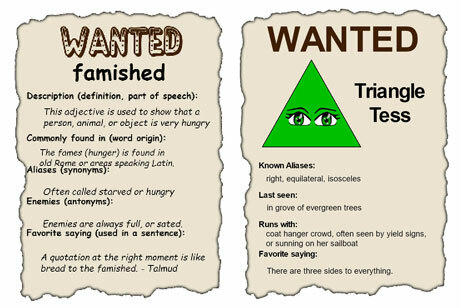 Wixie's Activities library includes a vocabulary-themed Wanted poster you can assign. Or students can also use the Wanted posters in the their templates library to explore vocabulary context and connect with new terminology. Even if you teach new terminology and vocabulary before students begin reading, it does not ensure that students will be familiar with all words in a text. As they are reading, have students keep a list of unfamiliar words. Assign the Vocabulary Trading Card template so students can develop a quick reference for a word on their own list. 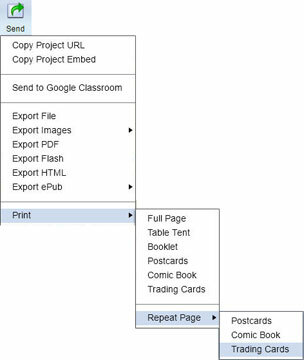 If you have a printer, students can click the Send button on the Wixie toolbar to print multiple copies of a Wixie project onto a single sheet of paper to make trading cards. Once they have cut them apart, have them talk about the meaning of these words with other students in the class and distribute print copies of their trading cards to students who would benefit from having it as an additional resource. According to Allan Paivio’s dual coding theory, if we code a word or concept into memory in two different ways, such as text and images, we improve our brain’s ability to remember it. Wixie includes tools that allow students to add images or draw their own pictures. A simple draw and label activity in Wixie is easy to do and a powerful way to get students to visualize synonyms and antonyms or multiple meaning words. Help students connect even more deeply by asking them to use Wixie’s voice recording feature to correctly pronounce the word or use it in a sentence. This is essential if you are working with homographs; words that are spelled the same but pronounced differently, such as bow and close. No matter what you chose to do, it is easy to make vocabulary instruction more than merely writing definitions and sentences that use new terminology. Use the templates and features of Wixie to bring vocabulary to life through a combination of media that helps students more deeply understand the meaning of words and remember them for future use.